Yesterday Cate mentioned that she’s been running “free” this week, meaning without gadgets. She’s just been running and getting into the moment of each run. Since I’ve been off running since the beginning of the month with that back injury (getting better! ), I’ve of course started to think about how I might ease back into it when I’m ready, and gadget-free running is at the top of my list (along with very easy, very short and gentle forays outside, like way less than feels like a “workout.” So I dug into the archives for this #tbt abot running without gadgets. Do you like to run free ever? How does it feel? We live in an era of gadgets and devices. On cold or rainy mornings when I take the bus to campus instead of walking or riding my bike, at least 50% of the other passengers are texting or checking Facebook, listening to music, doing something with their smart phones. 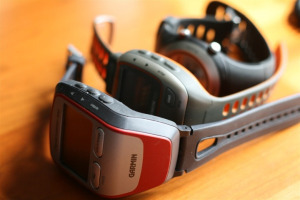 My latest gadget is my Garmin Forerunner 310XT GPS watch. When I’m out running, it tells me when to walk, when to run, what my pace is, how far I’ve traveled, how much time has elapsed. If I’m wearing the heart rate monitor, it reports my heart rate too. When I get back, it shares the information with my Garmin connect account. I can see the map of my route and it tells me the distance. It lets me compare that with my performance on previous runs. Leggings, a book, a yellow blanket and a pot of tea. Yesterday I read that in the UK riding for both leisure and commuting is down. As usual perceived lack of safety is the main reason people give for not riding and preferring other methods of exercise and getting to work. I’m not sure what the numbers look like in North America and elsewhere but I wouldn’t be surprised if it was the same. Interestingly, indoor riding is on the rise. And I’m part of that trend. Oddly enough. I’ve been thinking a lot about Zwift lately, about safety, women’s participation, and the gamification of sports. I will have lots of things to say! Truth be told, I’m even considering riding inside myself during the summer, some of the time anyway. There are reasons: I don’t like riding alone. I’ve got a very complicated schedule. But it’s not just that. Zwift is also fun in its own right. It’s fun racing down virtual hills, zooming down hills without braking. Fun taking corners at speed. I’m not worried when Zwifting about crashing into other bikes. I’m not worried about cars or other traffic. I love sprinting on Zwift with zero tension or fear, no looking out for cars. A white feather on a green circle. It turns out that I enjoy the gamification of sport. I liked getting a virtual feather the other day that when applied dropped my weight by 15 lbs. I wasn’t sure at the time what it was our how to use it but now that I do it’ll be fun to see the difference that has on my climbing speed. You can also get trucks which increase the benefit from drafting and aero helmets that make you more aerodynamic. For a better, more complete, explanation, see here. The weight thing is interesting. Zwift knows my actual weight and hills are harder as a result than they would be for an average sized cyclist. Both watts and weight matter when determining your speed. But my avatar–see below–doesn’t look as big as I do. What matters on Zwift is that she can keep up. And she can, because in the the real world I can. What matters is watts per kilo. I weigh a lot but I can also put out some pretty good watts. I’m okay–if occasionally disgruntled with the math and the physics of it all–with working harder to climb on Zwift. No one looks at me oddly. No one comments on my weight. Other riders just know my watts per kilo and I’m okay with that. I’ve had no weight loss suggestions, no comments on my size. That way, it’s a pretty relaxing environment. It’s made me realize how much people noticing my size bothers me in the real world. I’m sure I’ll have more to say later about this. I’m still thinking about it all. Oh, also having good indoor options makes it easy to stick to a training schedule. Some articles I read about Zwift in road cycling magazines said that North American summer was a ghost town in Zwift. It’s just full of Australians riding at odd times of day and triathletes who prefer indoor training. But as indoor cycling becomes a sport in its own right, it’ll be interesting to see what the summer numbers look like. That’s me below in the in the orange stripey jersey and my new sunglasses, earned for riding a certain number of kilometers. I also earned a helmet but opted out. This is one place I don’t need to worry about hitting my head. Last week I published about my back troubles that ensued a few days after Anita and I ran the Around the Bay 30K. Lots of people jumped in with sympathy, empathy, encouragement and suggestions. Thank you! The best suggestion came from Susan and others who recommended I try an osteopath. I know some people have had good results with chiropractors, but I’m deathly afraid of the idea of a snap adjustment. And I was in so much pain there was just no way. So a week after the race I contacted an osteopath who a friend had recommended for my neck issues but I’d never gotten around to calling. I knew Grace from yoga way back when I did Iyengar yoga and she was in my class. She used to be a nurse and she also taught Iyengar yoga, which is very precise. So o felt confident she had the right knowledge base that I could trust her with my back. By the time I went to see her a week ago, I was in excruciating pain by the end of every day. It usually felt a bit better in the mornings after I’d been lying down for the night. And then ramped up throughout the day until by the evenings it had me weeping and almost unable to move. Grace got me at the end of the day and could see that I was moving in a hesitant manner by then. Hesitant in that way you move when a possible wrong move will result in searing pain that makes the legs go weak. She had me stand and then slowly walk so she could size me up. Then she got me on her table…very carefully. And started doing very general manipulations of my body (the best being traction, when she pulled ever so lightly on my feet, which immediately released my back). I told Grace I’d been doing back exercises and stretching and yoga and had gone for a deep tissue massage. And in her view, those were all the wrong things, explaining why it was getting worse not better. What was the right thing? Rest. Total rest. She showed me two lying down resting postures for releasing my back. They both gave me wonderful relief. She showed me how to get into and out of a lying down position without putting strain on my lower back. She recommended I not sit for more than 15 minutes at a time. If possible, she said, take a day or two off of work. Things were kind of urgent because I was flying less than a week later (Sunday) for a short trip and then a week after that to China for work. When I saw Grace, the idea of sitting on a plane for any length of time seemed impossible. So though I couldn’t take a day off until Friday, I did go into hyper rest mode as much as possible, lying on the floor with my legs up on a chair or in “constructive rest” with a heating pad and bolster on my lower abdomen to release the entire area and hopefully reduce the inflammation in my back. Grace suspected the inflammation was pushing up against a nerve and that’s why it hurt so much and get worse as the compression of the day’s sitting took hold. Friday I went to see the nurse practitioner at my family doctor’s clinic. By then, after following Grace’s instructions for a couple of days I felt way better than I had. Thursday, hardly sitting (I even chaired a meeting at work standing up), I didn’t experience a single spasm. I told the nurse everything I was doing and she said “perfect!” So that was reassuring. Then I saw Grace one more time and she tweaked a few things and off I went. By Saturday I was feeling confident I could fly. Sunday came… no problem on my three and a half hour flight to the Bahamas. I write this on Monday, a day (with Anita) mixed with work, walking on the beach, swimming, constructive rest, and measured amounts of sitting. I’ve had quite a bit of work reading to do, and I have done most of it in a reclining position on my bed, legs bent at the knees. China doesn’t seem impossible anymore. And I’m a total convert to osteopathy after one round of appointments. Thanks, Grace! Have you ever tried an osteopath? I’m very late to the party, but I have finally gotten a FitBit. Mine is a fake one ($29.95 on Amazon), and it does count steps, more or less. Why did I get this gadget? Mainly, I want to know how active I am in my regular weekly routine; I haven’t been cycling much (yet), so walking has been much of my cardio-ish exercise. So what have I learned after a week with Fake-o-FitBit? First: My activity patterns tend to fall into one of three categories. working from home, I don’t get in many steps (3000-4000ish?) until I make a deliberate plan to take a walk. I sort of knew this, but having the data makes a stronger impression. Teaching and running around on campus, I get in many more steps than I expected (6000-7500ish?). Still, it doesn’t feel like much of a workout. Any day in which I plan a walk somewhere (or am traveling—airports are great for lots of step accumulation) seems to rack up more than 10K steps, all told. This is very useful information for me, because it’s telling me that if I want to be more active on days I’m working from home, I have to schedule it. Maybe this is obvious to everyone else, including me, but somehow having the numbers in front of me makes the situation clear. During the summer, I tend to cycle very often—riding around town from place to place, doing errands, etc. I also take longer road rides alone or with friends. So, that activity takes care of itself. But if I’m not on two wheels and want more activity out of my day, I have to make a plan. Second: step counts don’t tell me how hard I’ve worked physically. Duh. But again, I needed to experience the week and see the data to conclude that substantial cardio fitness for Catherine will not automatically happen through just stepping a lot. Third: It was totally worth $29.95 to get this information. Yes, I kind of knew this, but I respond well to data (even likely inaccurate and over-counted info from a possibly-pirated step counter). Not that I’m planning on throwing it away, now that I’ve learned some things. I’ll keep wearing it and sync’ing the info to see if any different patterns emerge. It seems like Fake-o-FitBit will help keep me honest and aware of what I am and am not doing each day. Fake-o-FitBit won’t help me set my fitness goals and physical activity schedule. That’s not what it does. I have to do that my damn self. Which I will. But it does help me see what counts as sedentary/meh/more active for me in daily two-legged movement. That’s worth the price. Dear readers, how do you use step counters? Do you find similar categories of activity? How do you use the data? I’d love to hear your experiences.